Where can I order Osmo Words? Words is available for purchase worldwide on our website as part of our kits: https://playosmo.com/en/shopping/. Words is not available for sale separately at this time. What ages is Osmo Words designed for? Osmo Words Junior is appropriate for kids aged 3+, while Classic is appropriate for ages 5-11. What is included in the Osmo Words box? The Osmo Words box contains 26 red and 26 blue English alphabet tiles (all uppercase) for a total of 52 tiles. In the Fall of 2017, the Words tiles will transition to upper case on one side and lower case on the other. And these new upper/lowercase tiles will be available for sale for educators as a stand-alone product, for those who wish to replace their uppercase tiles. What is the educational value of Osmo Words? Words teaches spelling, social-emotional skills, and critical thinking. Players can tackle the puzzles on their own or play in Versus mode for increased competitiveness. Do you have instructions for Osmo Words? How can I make Osmo Words talk in my language? We switched from Siri to a different voice synthesizer, and we now force an English voice on the synthesizer because that was the most natural one we could find. In a future update we will look into using the region of the iPad (or the language set on the game) to determine which voice to use (some have accents). How do I share a custom Osmo Words album with friends? To share one of your Words albums with other people, log into myOsmo in any browser on your iPad, open the album you want to share, click on the gear icon in the top right corner, and select 'Share'. You will then be given a link that you can email anyone who needs to access your album. How do I search for custom albums in Osmo Words? What is Junior Mode in Osmo Words? Junior Mode in the Words app means that some letters appear on the screen as hints. To do that in a custom album, you need to put parentheses around the letter or letters that you wish to appear as hints. E.g., '(p)arrot' will be presented on the screen as 'p' followed by five blank circles. How do I unpublish a custom Osmo Words album? You can unpublish an album by visiting the album link in myOsmo and clicking 'Unpublish' in the top right corner. How do I edit images in custom Osmo Words albums? To edit an image in one of your Words albums, log into myOsmo in any browser on your iPad, open the album you want to edit, then hover your cursor over the image you would like to edit and click 'Edit'. Once you are on the Edit Image page, click on the gear icon in the top right corner and select one of the options (Crop, Set as Album Cover, Replace or Delete). How do I download and play a custom Osmo Words album? To download custom albums in the Words app, go to the Library and tap "Download More At myOsmo" under "Installed" (the top section of the Library). You'll be redirected to the myWords page of the myOsmo website. Select any of the albums and tap "Add to Words game". You'll be prompted to open the album in the Words game. Tap the album to include it in the game. Please don't forget to deselect the albums that you don't want to be included. You may need to scroll down and open all of the subsections in your Library to make sure only the right albums are selected. How do I delete a custom Osmo Words album? To delete a custom Words album, log into myOsmo in any browser on your iPad, open the album you want to delete, click on the gear icon in the top right corner, and select 'Delete'. How do I create a proper noun (case-sensitive) Osmo Words album? Here are the steps for creating a Proper Noun (case sensitive) album. To do this, your account must be flagged as a 'Teacher' account, so let's check that first. Log into https://my.playosmo.com/ with your myOsmo account. In the left column (you may need to scroll down a bit), click on the 'Account' link. You should see a section labeled 'This Osmo will be used...' with some checkboxes. Either the 'At School' or 'For Homeschooling' checkboxes need to be checked. Once we have that set up, let's go and create the actual Proper Noun album. Now you are ready to make a proper noun album. Log into your myOsmo account. Click the myWords link at the top of the screen. Click the blue 'Create new album button' on the left. It will be called 'Untitled Album' to begin with, click on the title to rename it to whatever you want. At the very bottom of the webpage, you will see 'Album Type: [A] Regular'; click the 'Regular' link. You should see a pop-up asking if you want to make this a Regular or Proper Noun album. Choose Proper Noun album (you can also do this on albums you've already created). When you type in the words for each picture, just remember that whatever case you use here will be what the game expects. So you can do 'Frank' or 'frank', 'us' or 'US', etc. To see albums that are already available for play with lowercase tiles, please go the myWords search page in myOsmo and choose ‘Proper Noun’ from the ‘Show all’ menu. Why is the album I downloaded not playing in Osmo Words? After you tap an album to include it in the game, please don't forget to deselect the albums that you don't want to be included. It may require scrolling to the bottom of the library and checking all of the subsections. Then return to the home screen to play the album. If that doesn't work, please try reinstalling the Words app, restarting the iPad, and updating your iOS. If the above doesn't help, please write us at support@playosmo.com with a screenshot and the myOsmo URL of the Words album that isn't working for you! What are the two different colors of letters for in Osmo Words? In Osmo Words, you have the option to play against an opponent or play together. When you're playing against each other, the different colored letter tiles correspond to each of the two teams. When you're in the single-player mode, you can use either color to play. What are the different modes in Osmo Words? Words Junior has easier words and is meant for younger children. You can also use the Versus and Zen modes to play together or against each other. Junior mode will show most of the letters in the word so the player can guess the missing letters. Words Junior is appropriate for kids aged 3+. Use both sets of colored tiles to play against an opponent. See who guesses the word and spelling first! Play alone at your own pace. Practice deducing what the image is representing as well as honing your spelling skills. Do I have to spell out the word with the letters in the right order in Osmo Words? Nope! Osmo is so smart; you can put the letter tiles in front of Osmo in any order and at any angle. In Osmo Words, what does the white circle with a hand waving in it mean? You'll see this image after each round as a reminder to clear your pieces from the game surface. On to the next word! What about lowercase letter tiles for Osmo Words? They are $19 USD, and do NOT ship in a stackable storage container. Can I make my own Osmo Words albums? Yes! We encourage players to make their own Words albums. Go to your myWords dashboard. Click on Create New Album, and you will be automatically taken to the new album page. Click on Add Title (or on Untitled Album) to add your album title. Click on Add Image to upload a picture (or to take one, if you are using your tablet or phone). You can also drag multiple files to upload images in a batch. Hover your cursor over the image you have just added and click the Edit button. Type your chosen word in the Add Word field and select a difficulty. If you want some of the letters to appear as given on the screen, you can put them in parentheses. A(NT) will show as _NT, for example. Add a couple more words; the more the merrier! Return to your album homepage to add as many images and words as you wish. If you are making case sensitive albums (for use with lowercase Words tiles), your account must first be flagged as a 'Teacher' account, so let's check that. Click on your username in the top right corner and choose 'Account'. Scroll down to see a section labeled 'This Osmo will be used...'. Either the 'At School' or 'Homeschool' checkboxes need to be checked. Proceed to create your album as described above, with one modification. At the very bottom of your album homepage, you will see 'Album Type: [A] Regular'; click the 'Regular' link and choose Proper Noun album (you can also do this on albums you've already created). When you type in the words for each picture, remember that whatever case you use here will be what the game expects. So you can do 'frank' or 'Frank', 'us' or 'US', etc. See this video for more info. Also see this new video from our teacher resource page. When you upload your images, they are automatically resized and may also be cropped if they are too large. If you want to make sure all of your image fits and it isn't blurry, make sure it isn't larger than 768x1024 or smaller than 385x512. When you're editing an image, you can click on the gear icon on the right to choose from several editing options: Crop, Set as Album Cover, Replace Image, Delete. If you're searching on Google Images, try clicking the 'Tools' button at the top, then choose 'Large' size. That should get images that are mostly the right size. Alternatively, you can resize the images you already have. Paint.NET is a great free program that manipulates images easily if you are using a Windows PC. If you are using a Mac, you can resize photos directly after opening them in Preview. If your album is in a language other than English, please select it from the language dropdown menu at the bottom of your album home page. If your album language is not on that menu, please keep English as the album language and add your language name as an album tag. To share one of your Words albums with other people, log into myOsmo, open the album you wish to share, click on the gear icon in the top right corner, and select Share. You will then be given a link that you can email other people to have them access your album. If you decide to publish your album (by clicking 'Make Public'), it will be reviewed by Osmo staff. The approval process currently takes up to 2 business days. If you need it reviewed fast, please let us know the exact name of the album as well as the email address used for your myOsmo account. All public user-made albums can be searched at the myWords Discover page. You can unpublish an album by visiting the album homepage and selecting Unpublish from the gear menu in the top right corner. You can delete one of your own albums by visiting the album homepage and selecting Delete from the gear menu in the top right corner. Can I use my own Osmo Words pieces? 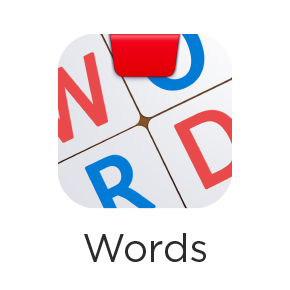 Osmo's Words tiles were made specifically for the game, so we can't guarantee that any other letter tiles will work. What do I do if Osmo Words crashes? Any time an app crashes, it's good practice to close other open apps (double tap home button and swipe the windows up to close them). Also please try reinstalling the Words app and restarting the iPad. If it doesn't help, please write us at support@playosmo.com with your iPad model number. You can find the model number printed on the back of your iPad.